You are here: Home / Lifestyle / Plant-Based Or Vegan: What’s The Difference? Plant-Based Or Vegan: What’s The Difference? It seems more and more people are considering a plant-based or vegan diet in order to improve their health. The scientific research that exists showing the benefits of a plant-based diet is overwhelming. Not just in overall health, but also in preventing, and in most cases reversing, chronic western diseases like diabetes, heart disease, and even cancer. People are starting to listen and that’s great! But, it’s also important to know the difference between going “plant-based” and going “vegan”. Vegan and plant-based diets are similar in some ways, but there are also some BIG differences. A “plant-based” diet centers around eating whole, plant-based foods in their most natural and unrefined state. Plant-based eating isn’t just about eating fruits, veggies, legumes, grains, nuts and seeds; it’s also about removing ALL animal products like meat, fish, eggs, and dairy. All oils, including olive and coconut, are either used very sparingly or completely eliminated. They are usually not part of a whole foods, plant-based diet because they are heavily refined; are 100% fat; are very high in calories; and contain little to no nutritional value. Because there are no animal products in a plant-based diet, it’s easy to see why some consider plant-based diets to be the same as vegan. Veganism is a lifestyle choice that involves, not only diet, but politics and ethics as well. Vegans eliminate all animal products from every area of their lives. They do not wear leather, fur, wool or silk. And, they do not use products from insects, such as honey or beeswax. Animal tested products, such as toiletries and make-up, are not part of a vegan lifestyle. 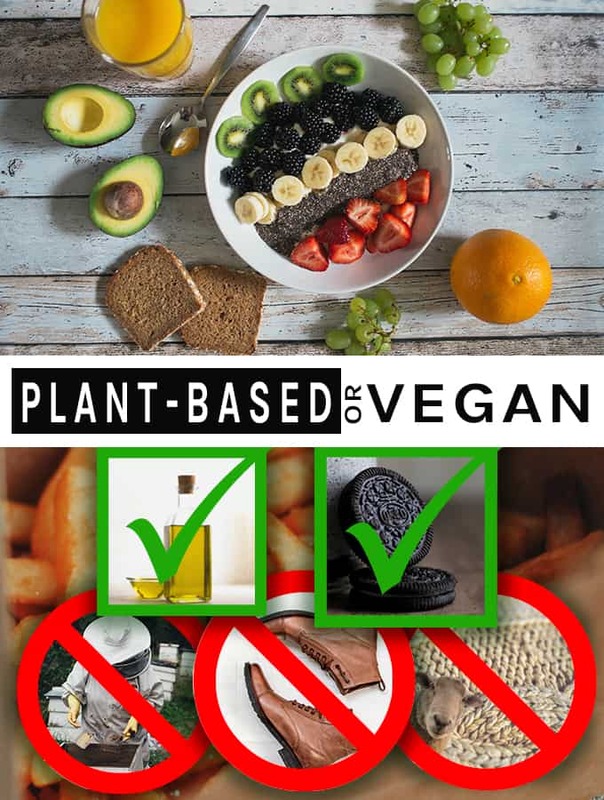 “Plant-based” foods can be considered vegan because they contain no animal products, but not all vegan foods can be considered plant-based or healthy. For example, french fries, Oreos, potato chips, many fake meats, and soda are “vegan,” but they are not considered to be “plant-based.” Why? Because they are refined food products and usually not healthy at all. A “plant-based” diet can be vegan(adjective) by definition, but someone who follows a plant-based diet is not necessarily a Vegan(noun). While they may choose to consume only plant-based foods, they might still wear and use products derived from animals. The primary focus of a plant-based diet is health, while Veganism has farther reaching implications concerning animal rights, the environment and is not necessarily centered around health. There’s no denying the benefits of removing animal products from our diet and lifestyle, regardless of one’s reasoning. But, it is extremely important you understand both sides of the issue in order to achieve your goal. For me personally, adopting a plant-based diet was solely about improving my health. But, over time it became very clear the impact my food choices had on, not just me, but all of creation. Great article explaining the difference between plant-based and vegan. I’ve been vegetarian for many years and am inching toward plant-based as I believe it’s the right way to eat. Educating those around me is a constant struggle. Thanks, Shari! Yes, it can be quite a struggle. I think best answer, at times, is simply our lifestyle and be living evidence of its benefits. Grace, peace, good vibes & HAPPY NEW YEAR. Great blog post. I love how you clarify health and lifestyle. Too often people assume vegan is healthy, but a diet of Fritos, Oreos and Coke, all of which are vegan, is far from healthy! Thank you for illustrating that veganism is about so much more than diet. Thank you, Shane! I’m on my fourth week of a plant-based diet. I went “all-in” and wasn’t mamby-pamby about easing into it. I knew that I had to do it that way…and I’ve seen immediate results. Thank you, also for your article on the family transition. One son and my DIL (who lives with us, while attending nursing school here and her hubby, our eldest son, is 4.5 hours away in school studying engineering) LOVE the all plant-based meals. They look forward to them and we three are feeling the difference. My youngest, however, is the most verbal disagree-er and accuses me of being a liberal vegan now—when I have said nothing about animals. I really appreciate the explanation. Like you, I started this journey for my health. Over the past year, I’ve slowly watched my cholesterol levels creep up and my body pain increase. I have Grave’s Disease and my doctor is monitoring me every six months–which makes this change even more exciting. I just had labs yesterday because I’m feeling really hyperthyroid now and may need a Synthroid adjustment. (Can plant based WOE re-stimulate an ablated thyroid? Just wondering.) Like your daughters, I had a quickie lunch at CFA and my gut paid dearly for it. I pictured my stomach yelling at me and throwing the stuff back up to rebel. HA! I learned my lesson! One more thank you and I’ll close. Thank you. Thanks for sharing your story, Carole! Keep up the good work!! !